Rowland Smith in full flight. Picture – Shearing Sports NZ. REIGNING Golden Shears and New Zealand Open shearing champion Rowland Smith continued on a relentless march in quest more of the top honours and a possible second world title when he won the Te Puke A and P Show’s open final on Saturday. Completing a Hawke’s Bay clean sweep of the four titles at the show, it was 32-year-old Smith’s eighth win in a row in three weeks since resuming at Wairoa on January 19. It took his career tally to 143 open wins, 43 of them in the two years since he cracked the century at the Counties Shears in February 2017. It was his first win at Te Puke, meaning he has won open titles at 31 of the 59 shearing venues currently on the Shearing Sports New Zealand calendar. Sir David Fagan’s 642 open wins included victories at 25 of the current venues, and 26 where shearing competitions are no longer staged. Hawke’s Bay–based Smith faced three Te Kuiti shearers in the bid for his fourth win in nine days and won by 2.66pts from Fagan’s son, Jack, the runner-up in a four-man final of 15 sheep each. It needed the better quality points, after Smith was beaten to the finish by both the younger Fagan and first-man-off Digger Balme, who completed the job in 12min 42sec but ultimately had to settle for fourth place behind Smith, Fagan, and Mark Grainger, who had won the Tauranga show title by a similar margin from Fagan last month. Napier shearer Ricci Stevens had his third win in his last season of senior shearing, Elsthorpe farmer had his second in the intermediate final, and Atawhai Hadfield, of Ruakituri, had his eighth win of the season in the junior final. New Otago Shears open shearing champion Brett Roberts, left, with 10-times open woolhandling champion Joel Henare. Image – supplied. Meanwhile at the Otago Shears open final in Balclutha on Saturday, victorious Southland shearer Brett Roberts strengthened his hopes of a place among the elite at the Golden Shears next month. The 24-year-old Roberts has completed a clean sweep of wins across the grades in Balclutha over the last 10 years and beat four national representatives in the 20-sheep final. Reigning world champion John Kirkpatrick was second and teams champion partner Nathan Stratford, of Invercargill was third. Fourth and fifth respectively were Troy Pyper, of Invercargill, and Wairarapa farmer David Buick, both national trans-Tasman series representatives. Roberts’ win, by just over a point, came three weeks after his first A-grade open win, at the Northern Southland Community Shears near Lumsden. He won two Golden Shears titles in Masterton, in the junior grade in 2010 and senior in 2014, but is yet to make the Shears’ Open semi-finals in four attempts for best placings of 15th in the Top 30 quarterfinal shoot-out last year and 27th in 2016. He just missed the cut on the other two occasions. He has; however, the unprecedented record of having won in all four grades at Balclutha, now a total of six wins from the junior title in 2010, intermediate in 2011, the senior title three times consecutively in 2012, 2013, and 2014, and the latest triumph. He has served the open-class apprenticeship patiently, reaching the 20-sheep final for the first time last year and finishing fifth, a pointer to yesterday’s win. Having also had a win in good company at the West Otago show in November, he says ultimately it’s all about the big event in Masterton in three weeks’ time. Another making a bee-line for the world championships is reigning wool handling champion Joel Henare, who at Balclutha won the New Zealand Woolhandler of the Year open title for a 10th time, and 5th time in a row. Henare is favoured to win the Golden Shears title again, and a World Team Selection Series final on the same day. The Otago championships were also a triumph for Southland-based Destiny Paikea, originally from Northland and who won the junior shearing final and was runner-up in the Woolhandler of the year junior final. 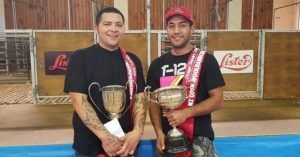 The Elers family from Mataura was also amongst it, with 2017 World Championships Cook Islands representative Maiden Elers winning the Senior Woolhandler of the Year title, Krome Elers the Junior title, and Nova Kumeroa Elers being runner-up in the South Island Woolhandling Circuit Senior final. Meanwhile, the CP Wool New Zealand Shearing team of Buick and Stratford had a comfortable second test-match win over Wales. Open final (15 sheep): Rowland Smith (Hastings) 13min 4sec, 44.667pts, 1; Jack Fagan (Te Kuiti) 12min 56sec, 46.933pts, 2; Mark Grainger (Te Kuiti) 13min 40sec, 51.467pts, 3; Digger Balme (Te Kuiti) 12min 42sec, 51.767pts, 4. Open Plate (6 sheep): James Ruki (Te Kuiti) 6min 50sec, 24.5pts, 1; Turi Edmonds (Raetihi) 6min 9sec, 24.95prs, 2; Marshall Guy (Kaeo) 6min 23sec, 25.65pts, 3; Willie McSkimming (Taumarunui) 6min 35sec, 27.083pts, 4. Senior final (7 sheep): Ricci Stevens (Napier) 8min 21sec, 33.621pts, 1; Paul Swann (Wairoa) 8min 36sec, 35.8pts, 2; Pauline Bolay (Canada) 8min 31sec, 35.836pts, 3; David Hodge (Te Puke) 8min 34sec, 39.986pts, 4. Intermediate final (5 sheep): Mark Ferguson (Elsthorpe) 7min 21sec, 31.85pts, 1; Reuben Alabaster (Taihape) 7min 3sec, 31.95pts, 2; Keith Swann (Wairoa) 7min 28sec, 33.4pts, 3; Liam Pritchard (Pongaroa) 7min 12sec, 33.6pts, 4. Junior final (3 sheep): Atawhai Hadfield (Ruakituri) 5min 29sec, 27.117pts, 1; Levi King (Gisborne) 5min 35sec, 28.417pts, 2; Topia Barrowcliffe (Piopio) 5min 55sec, 28.75pts, 3; Matthew Smith (Otorohanga) 6min 58sec, 31.567pts, 4. Shearing: CP Wool International Series Second Test (12 sheep): New Zealand 106.0708pts (David Buick 13min 48.35sec, 53.0008pts; Nathan Stratford 14min 59.12sec, 53.706pts) beat Wales 105.505pts (Lloyd Rees 13min 95.16sec, 62.258pts; Aled Jones 14min 54.94sec, 63.247pts) by 18.8342pts. New Zealand lead the series 2-0. The Third test is at the Southern Shears in Gore on February 16. Open final (20 sheep): Brett Roberts (Mataura) 18min 29.35sec, 62.4175pts, 1; John Kirkpatrick (Napier) 18min 53.94sec, 63.447pts, 2; Nathan Stratford (Invercargill) 19min 45.69sec, 64.2845pts, 3; Troy Pyper (Invercargill) 18min 20.09sec, 64.9545pts, 4; David Buick (Pongaroa) 19min 54.19sec, 66.1595pts, 5. Senior final (10 sheep): David Gordon (Masterton) 11min 31.5sec, 42.275pts, 1; Brandon Maguire Ratima (Winton) 11min 56.55sec, 42.3275pts, 2; Jade Maguire Ratima (Winton) 11min 46.63sec,42.8315pts, 3; Barney Cummings (Pleasant Point) 11min 58.32sec, 44.916pts, 4; Alex Smith (Rakaia) 11min 38.81sec, 45.2405pts, 5. Intermediate final (6 sheep): Tyson Crown (Mataura) 10min 39.87sec, 37.3268pts, 1; John Cherrington 10min 31.12sec, 40.3893pts, 2; Stacey Whitu (Gore) 10min 0.4sec, 41.3533pts, 3; Brayden Clifford (Gore) 10min 31.41sec, 41.4038pts, 4; James Dickson (Gore) 11min 52.5sec, 48.125pts, 5. Junior final (4 sheep): Destiny Paikea (Heriot) 11min 24.34sec, 40.217pts, 1; Katie Reid (Scotland) 10min 4.65sec, 40.9825pts, 2; Lexi Phillips (Hamilton) 10min 26.75sec, 45.3375pts, 3; Jimmy Napier (Gore) 11min 1.5sec, 49.825pts, 4; Wiremu Pewhairangi (Mataura) 10min 10.88sec, 56.544pts, 5. Wool handling: New Zealand Woolhandler of the Year — Open final: Joel Henare (Gisborne) 145.82pts, 1; Pagan Karauria (Alexandra) 225.506pts, 2; Keryn Herbert (Te Kuiti) 288.25pts, 3; Monica Potae (Milton/Kennedy Bay) 390.38pts, 4. Senior final: Maiden Elers (Mataura) 161.524pts, 1; Destiny Paikea (Heriot) 193.69pts, 2; Natalie Collier (Gore) 219.956pts, 3; Tyle Hira (Onewhero) 335.44pts, 4. Junior final: Krome Elers (Mataura) 122.84pts, 1; Amber Poihipi (Ohai) 143.15pts, 2; Makayla Crawfod (-) 158.34pts, 3; Samantha Allan (Balclutha) 162pts, 4. South Island Circuit — Open final: Joel Henare (Gisborne) 89.424pts, 1; Pagan Karauria (Alexandra) 109.206pts, 2; Candy Hiri (Gore) 141.684pts, 3. Senior final: Tyler Hira (Onewhero) 109.77pts, 1; Nova Kumeroa Elers (Mataura) 136.224pts, 2; Natalie Collier (Gore) 174.374pts, 3. Junior final: Heaven Little (Balclutha) 106.06pts, 1; Amber Poihipi (Ohai) 108.63pts, 2; Sunnii Te Whare (Ohai) 137.87pts, 3. Open final (20 sheep): Phill Wedd (Napier/Silverdale) 19min 58sec, 73.3pts, 1; Neville Osborne (Dargavlle) 18min 41sec, 74.25pts, 2; Gary Rix (Dargaville) 23min 52sec, 85.05pts, 3. Senior final (10 sheep): Stefan van Oorschott (Kaikohe) 12min 22sec, 48.45pts, 2; Dan Berger (Ahuroa) 12min 52sec, 50.7pts, 2; Lee Cheyne (Te Kauwhata) 13min 59sec, 54.65pts. Intermediate final (6 sheep): Michael Boyd (Dargaville) 8min 28sec, 35.9pts, 1; Alan Boler (Wellsford) 8min 29sec, 37.61pts, 2; Rex Finlayson (Kai Iwi Lakes) 9min 10sec, 50.71pts, 3. Junior final (3 sheep): Tommy Stevenson (Tangowahine) 6min 52sec, 36.6pts,1; Hazel Wood (Ruawai) 8min 14sec, 36.7pts, 2; Danielle Boyd (Dargaville) 7min 40sec, 39.67pts, 3. Novice final (2 sheep): Gus Berger (Ahuroa) 9min 29sec, 45.95pts, 1; Rani Davis (Dargaville) 7min 19sec, 49.45pts, 2; Trestan Rix (Dargaville) 8min 39sec, 8min 39sec, 53.95pts, 3. Veterans (3 sheep): Neil Sidwell (Kaukapakapa) 4min 45sec, 29.25pts, 1; Rex Finlayson (Kai Iwi Lakes) 5min 10sec, 29.91pts, 2; Lee Cheyne (Te Kauwhata) 4min 32sec, 29.94pts, 3; Richard Dampney (Kaikohe) 4; Jeff Wood (Ruawai) 5. Source: Shearing Sports New Zealand.